This is easy to use, easy to apply and quick drying (1-2 minutes). 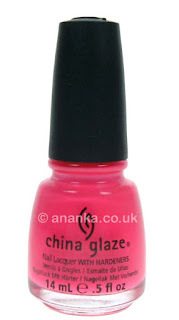 It is a lovely bright neon pink colour that dries semi matte and rubbery! I really liked this finish and the colour! Lasted really well. Purchased from = eBay - I'm sure this was a gift from father-in-law! you have wonderful father-in- low my dear! Escaping Reality sounds good ;o). Beautiful pink. I like it. It really is a cutie - looks good on you! Que show arrasou bela cor bom final de semana.